Allowing a domestic abuser to own a firearm is like giving a box of matches to an arsonist: there's only a matter of time before they use it. In fact, according to the Giffords Law Center, "abused women are five times more likely to be killed if their abuser owns a firearm, and domestic violence assaults involving a gun are 12 times more likely to end in death than assaults with other weapons or physical harm." These statistics are startling and are why states like California have banned convicted domestic abusers from ever being able to own a gun. After frustration with the Trump Administration's slow to nonexistent efforts to combat gun violence, California has decided to go its own way. This year, the state's permanent gun ban for certain domestic abusers will go into effect. 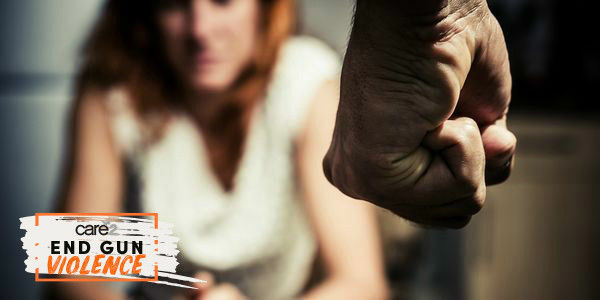 California Assembly Bill 3129 not only ensure abusers don't get new guns — something currently regulated under federal law — but it will require persons convicted of domestic abuse on or after January 1, 2019, to hand over all firearms in their possession — specifically, those convicted of a misdemeanor domestic violence offense or for battery on a spouse, cohabitant or person the defendant currently or previously dated or engaged in a relationship. The new law makes California a member of a small club of states that strip gun ownership privileges from domestic abusers. Other states include New York, Connecticut, Hawaii, New York, Pennsylvania, Nevada, Colorado, Illinois, Iowa, Massachusetts, Minnesota, New Jersey, Rhode Island, and Tennessee. These state laws are meant to keep America safer. There is a blaring link backed by years of data that connects domestic abusers with mass shootings and other killings. Nikolas Cruz, the Parkland shooter, abused his ex-girlfriend before he took the lives of 17 men and women. So did Devin Patrick Kelley who killed 26 in Texas last year. In fact, according to studies, 54% of mass shooters had committed domestic or family abuse before their crimes. So why have so few states passed these common-sense laws? As gun violence continues to ravage our nation and statistic after statistic identifies domestic abusers as some of the most likely culprits of deadly mass shootings, it is time for our state governments to act and join the current jurisdictions that are leading the way to break the cycle of domestic abuse and gun violence. If you didn't see your state listed above, that means they are one of the many governments that still doesn't require that convicted abusers relinquish their weapons. And their lack of action is putting all of us in danger. Please sign the petition and demand that the remaining 35 states strip guns from abusers.